CSE doesn't usually reveal the names of its current or former liaison officers, but the former occupants of those positions do sometimes acknowledge that they once held the job, and on other occasions some enterprising soul figures some of them out for himself. In this case, we now have the somewhat oblique admission by the former occupant that CSE's first liaison officer to the Australian Signals Directorate (ASD) and New Zealand's Government Communications Security Bureau (GCSB) was Gwen Beauchemin. 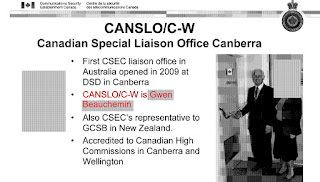 The CANSLO/C-W (Canadian Special Liaison Office/Canberra-Wellington) position was established in 2009, and Beauchemin served in the role, which is based at ASD in Canberra, from 2009 to 2013. 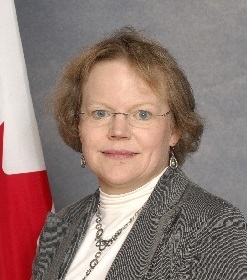 She then went on to become the Director of the Canadian Cyber Incident Response Centre (CCIRC) at Public Safety Canada, where she remains today. That would be her, standing on the right with her head blanked out, beside then-CSE Chief John Adams. The original page comes from this CSE document (see page 452). You can read more about the functioning of the liaison offices here. Update 10 November 2015: On the question of Special vs. Senior (see earlier discussion here), I'm starting to think that the office is called the Canadian Special Liaison Office and the senior occupant of that office is called the Canadian Senior Liaison Officer, with both being abbreviated as CANSLO. That explanation doesn't account for the occasional reference that turns up to a Canadian Senior Liaison Office or Canadian Special Liaison Officer, but it seems to be the best fit. Incidentally, CANSLO wasn't always the term used. This NSA document notes that the title of Canada's liaison officer at NSA was "changed to 'Canadian Senior Liaison Officer', abbreviated 'CANSLO'," effective 15 June 1954, and that the title of the liaison officer to GCHQ was also changed at the same time. As this document shows, the previous title was CBSLO, which presumably expanded to Communications Branch Senior Liaison Officer (CSE was then called the Communications Branch, National Research Council).